If you do start with your bodyweight workout first, feel free to repeat again the very next day. But if you start off with a weighted workout, you must leave at least two days before doing the bodyweight exercises as your body will need time to recover. Also, don’t feel like you can’t train other body parts, you can! But if your glutes are a high priority and you want to tone and lift them quicker, put them in your workout first to make sure they get a lot of attention. Load a barbell in a rack, then step underneath it so it rests across your upper back and traps. Lift it off the rack, take several steps back and stand with your feet double hip-width apart, toes turned out. Bend your knees and track them over your toes as you squat down, keeping your torso erect and shoulders relaxed. When you’ve come below parallel, pause a moment, then drive up powerfully until your legs come to a full extension without locking out. Vary foot position with these to hit the glutes at different angles, do them with toes out, or with them straight ahead. Load a barbell, then lie down on the floor and roll it up until it comes over your hips. Grasp the bar with your hands on either side to hold it steady, then bend your knees and place your feet about shoulder-width apart. Move your heels back toward your glutes as far as is comfortable. Holding the bar steady, press your hips up quickly until they are in line with your knees. Lower slowly to the start and repeat right away. Use a pad on the bar so it doesn’t dig into my hips. Hold a loaded barbell with an overhand grip and stand with your feet hip-width apart. Bend your knees slightly so they are soft, not locked. Keeping your back flat, hinge from the waist to fold forward, lowering the barbell along the front of your body until it comes to mid-shin — lower if flexibility allows. Reverse the move and rise up halfway, stopping when your torso comes to about 45 degrees, then lower into the next rep.
Do this half-range of motion to keep a constant tension on glutes. If you come all the way up, you begin to rely on your hamstrings instead. Position your shoulders on a flat bench so they are supported and plant your feet about shoulder-width apart on the floor, knees bent. Lower your glutes as far as you can to begin, then extend one leg straight out in front of you or, alternately, straight up in the air. Extend your upper arms to the sides along the bench for stability. Press through the heel of the working leg and lift your hips explosively up toward the sky. Pause a moment at the top, then slowly lower to the start. Keep your non-working leg still. If you use it for momentum, it will detract from the work of the glutes. Get on all fours with your hands underneath your shoulders and your knees underneath your hips. Shift your weight to your left side to de-weight your right leg while keeping your hips square. Keeping your right leg bent, lift it behind you and straight up toward the ceiling, pressing the sole of your shoe skyward. Pause a moment and squeeze before lowering to the start. Make sure your hips stay square and parallel to the ground. 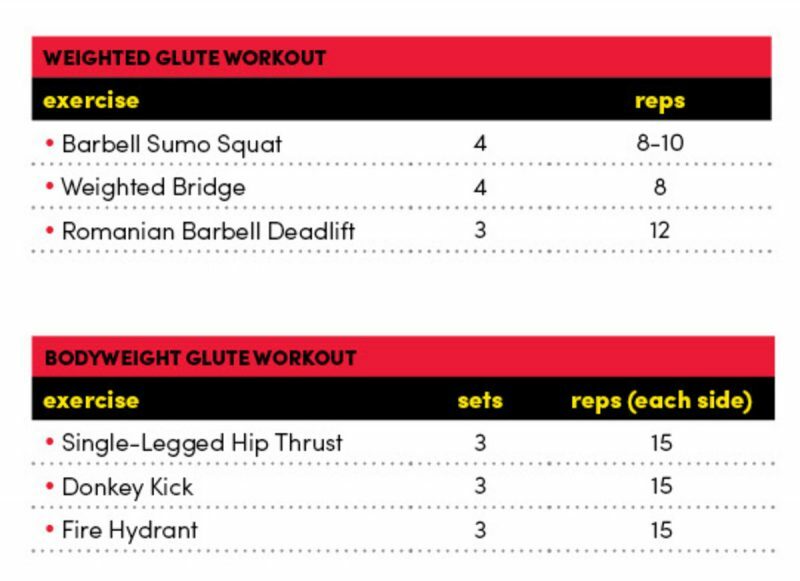 If you start to twist, it takes the emphasis off the glutes. Shift your weight to the right side without tilting your hips so your left leg is de-weighted. Keeping your knee bent, open your leg out to the side and upward, like a dog visiting a fire hydrant. You’re going to be tired at this point, so go slowly and really focus on the glutes. Resist the urge to use momentum, and squeeze hard at the top.